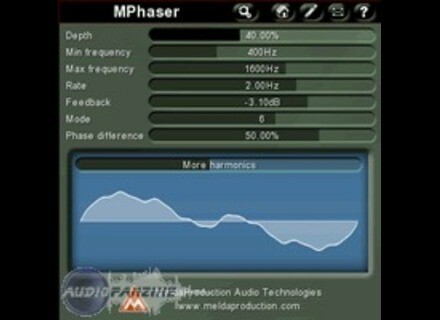 MPhaser [Freeware], Software Phaser from MeldaProduction. MeldaProduction has released two new free VST effect plug-ins for Windows - MPhaser and MRingModulator - and updated MDrummer to v2.03 and MCompressor to v1.05 beta. You can save your own presets. Most plugins can perform upsampling which minimizes aliasing, therefore it is useful to improve sound quality. 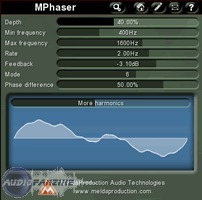 MPhaser is a traditional phasing effect plugin. MRingModulator performs standard ring-modulation effect using two oscillators. Continuously adjustable waveform shapes for both oscillators. Oscillators can also modulate each other to generate even more complicated shapes. Adjustable phase difference useful to perform some kind of stereo-expansion. Ratio converted into logarithmic scale (previous presets converted of course). Space removed from most of the controls to avoid collision with "play" key. Improved painting performance with caused drawing system overload and hosts could not paint indicators. Smart units showing important dB values in 100% zoom. Non-linear attack/release time editors for better configuration of small values. Added gain-reduction and output level meter. Smart units showing important frequency values in 100% zoom. Q now editable using mouse wheel over a band-point. Playback disabled during time-consuming operations (such as drumset loading) to minimize pops. Fix: Editor size in Reaper. Audiofile Engineering StudioLife Audiofile Engineering announces a new bundle called StudioLife which includes their Wave Editor, Rax, Sample Manager, and Spectre products along with Audio Unit Manager for $329. Lexicon Ionix FW810S Lexicon Introduces IONIX FW810S FireWire Audio Interface with dbx Mic Pre's and Dynamics. Line 6 TonePort becomes Studio Line 6's TonePort series turns to "Studio" and changes to black. Meet the POD Studio GX, POD Studio UX1 & UX2.